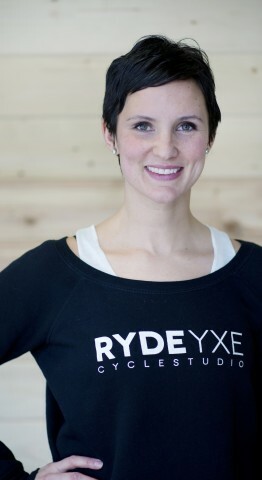 What makes you most excited about being a RYDE instructor? Teaching at RYDE gives me an opportunity to connect with others in the great community of Saskatoon and to either start my day doing something positive or leave behind parts of the day that aren’t serving me by being surrounded by a room full of AMAZING ryders. I love walking into the studio knowing that behind the barn door there is an experience that can only be described by Ryders. The music, the lights, the people, the ENERGY is empowering. I get on the bike for the same reason everyone else in the room does. I get on the bike to share in reaching fitness goals, emotions, and to be part of a team that motivates to keep pushing. What is your favourite thing to do in YXE? Farmers market, walks/ runs along the river with my family, Skating by the Bess, Huskie games, Jazz Festival. Born and raised in Saskatoon – I love it all. What are your favourite YXE eats!? Keo’s Kitchen – red curry , Poached for Breakfast, Duck Duck Goose for Poutine, UNA for Pizza, Las Palapas for coconut shrimp… the list goes on! Too many great places. How can we find you on Instagram?